As promised, I will continue to go through some of this week's new additions to the stash. I began with the NYX eye pencils, and now want to discuss something else that I think is a marvelous idea. I post/discuss a lot concerning brushes. I love love love good brushes. I like them to feel like silk on my skin, and to distribute color as though you can hardly tell where it begins and ends. What I don't want, are brushes that shed, are stiff, or resemble the feeling of sandpaper to skin. Because of this, I probably drop a little more money on them, than most people feel is necessary on attaining the perfect arsenal (However, in my defense, I take very good care of them, and they will probably last me until I am old and sitting in a nursing home somewhere petting them, because none of my children visit me, and I talk to myself...). But, as I live and breathe, and attest to my equal opportunity mentality towards beauty products in general, I confess that I have found a few supplementary brushes in less than kosher places. 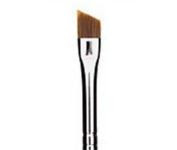 One of the brushes that I use most often, is my MAC 266 angle brush for brows and liner. I'm talking, every day sort of usage. I'm not sure that there's ever a day that I apply my makeup where I don't work my brows...add to that some lid lining, and you've made for another reason to wash your brush during your routine (also read: annoying). For this reason, I'm always on the lookout for great liner brushes so I don't have to switch back and forth--and I found one. At the art store. Yup, you read right. I was badgering my artist cousin about the paintbrushes he uses to create his hand painted t-shirts, and decided to leave him alone and just check it out for myself. What did I find? A Loew-Cornell Mixtique 1/8 angle brush that is comprised of goat hair, red sable, and Golden Taklon fiber. The blend translates as being super soft, and the width is exactly half the width of my 'ol standby, MAC 266. You can grab one that is twice the size in width, to perfectly mimic some of the more common makeup brush sizes, but I wanted something very thin to vary my collection. I've test run it on a gel-liner, shadow liner, pot liner, and my trusty brow shadow and it has succeeded with flying colors. Here's the catch though: it was only $2.50. Yup! Find an art store.